Peter Glenn, former retail activist and consumer advocate, and author of “It’s Not My Department,” once said that there are two kinds of retailers: the basics and the desires. The basics consist of retail organizations that sell commodity products such as paper goods, offices supplies, and other every day staples. The desires, on the other hand, are those retailers who are considered destination retailers – places customers look forward to, with the hope of having an unforgettable experience. Such an experience is outside the normal routine of shop, wait in line and pay. The desires are beyond a transaction: they can become catalysts of emotions. For a child, think Disney World. Why is this relevant to our world of yoga and wellness? Because we are a destination. We offer a place or space that can be comforting, healing, and generally take us away from our own personal norm, whatever that may be. And truth be told, the act of shopping is a form of stress-release, primarily for women. 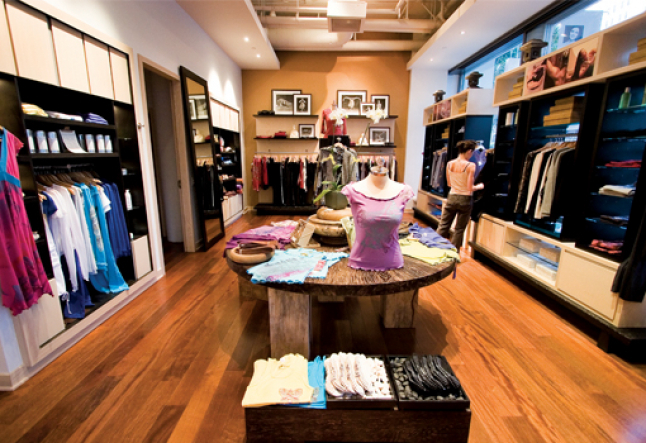 Shopping within a yoga studio environment, therefore, seems to be an exceptional antidote to everyday stresses. Within the yoga studio, retail might be a wall of merchandise, a floor display, or just a few books, but designed to serve those customers who may not cherish the larger, overloaded world of stores and malls, or even the Internet. The products should enrich and educate clients, and reflect the business owner. How can a retail environment be created within a yoga studio that successfully acts as a ‘desire’ for clients, while at the same time minimizing workload and anxiety for the owner? While there are clearly defined processes to building a retail section or store, the fact is that retail is part science and part art. The science aspect uses historical and current data to make decisions for future plans; the art is in the buying, merchandising and selling arenas. Being successful at retail requires that one understands both the science and the art, and that one has a passion for making his yoga business rewarding and profitable. After all, the profits from the sales can help cover current studio expenses, or can simply and quite importantly help increase the bottom line to reinvest into the business. So how does one go about carving out or creating a functional retail area? 1. Location, Location, Location. This holds true for where you are situated on the street, but the interior of your retail store also needs to be accessible, visually and physically, from the entrance or lobby, and easy to walk through, in or around. 2. It’s about the space. The square footage of the area you have dedicated to retail will dictate the amount of merchandise you are able to buy and put on the sales floor. If you have storage for back stock, that changes the picture in regards to how much inventory you can purchase. Remember: the amount of inventory you buy is directly based on your planned sales for the month, quarter and year. 3. Maximization is a must. Maximize the store area by using the walls for fixture and the floor for freestanding displays. Typically the wall fixtures should start 18” off the ground, and go no higher than 8’. Any higher and people can’t reach the goods. For floor fixtures, also consider the height being no more than 4’6” to 5’, as generally it’s difficult to see anything over that height. 4. The Register Rules. The yoga studio register (or Point of Sale) should be located nearby, or even in the store. Many studios have only one or two registers and use them for both scheduling and transactional purposes. What’s important is that the retail area is close to the register. This is for both customer service purposes, and for the salespeople to keep an eye on the merchandise. 5. Lighting. Lighting. Lighting. This is equally as important as location. Lighting directly affects the spectrum of product colors displayed on the fixtures and enhances the presentation of any store. Lighting can be affordable and energy efficient based on the choice of the light bulb. Other considerations when creating a user-friendly space are paint colors and floor materials. For example, one might incorporate an area rug to designate the space as ‘retail,’ or paint the wall a different color to highlight this section of the studio. Retail can be costly, particularly with regard to stocking inventory. Effectively managing inventory is critical to the success of a store. With too much inventory, you lose liquidity, overwhelm your clients, and clutter your space. Too little, and you risk losing potential sales. For those who already sell products, continue to ask such questions as “who’s buying and what’s selling?” Knowing who your core retail clients are and what they are purchasing is critical information to collect and analyze in order to make future buying decisions. Listening to your clients as they shop is a great way to keep your finger on the pulse of your market. Ask for their suggestions of what they would like to see, and take that into consideration when planning your inventory. Consistent awareness and attention to what is working, along with a willingness to let go of the things that aren’t will keep a retail business in line with its individual market. The first and most important step when entering the retail arena with a yoga business is to have a plan, a budget and the resources to get started in the right direction. Once you've laid a strong foundation, the chances of achieving success are much stronger.